First impressions count. In an urban landscape, where buildings compete with one another for anyone from visitors to tenants to customers, a striking entryway is the first thing to entice people inside. Throughout the world, many museums, cathedrals, theaters, and office and government buildings have mastered the art of curb appeal, extending far beyond just a couple of gorgeous doors. Built to convey prestige and importance, these entryways both present a captivating cover and prepare you for the grand contents within. These are my favorites. In the early 1400s, the Bern Minster was planned as a Catholic church. Over the course of its 400-year construction, however, its fate changed during the tumult of the Reformation, and today a Protestant congregation worships in this truly awesome cathedral. I first spied its massive structure, rising above its shorter neighbors, from a trail across the Aare River. Closer up, the portal and one of the most complete late-Gothic sculpture collections in Europe completely captivated me. The five Foolish Virgins stand to the left of the doors and the five Wise Virgins to the right, all of them holding their oil lamps. Under them, beautifully painted faces and torsos of the Queen of Sheba and King Solomon project from the wall. The archivolt contains three rows of figures: Along the outer row, Jesus, Mary, and the Apostles stand on individual platforms; eight prophets from the Old Testament line the central row; and the inner row sports five angels holding the Arma Christi — the Instruments of the Passion, such as the Cross on which Christ was crucified and the pillar where He was whipped. A sixth figure in this last group, at the lower right corner, is hardly angelic: a demon blowing a horn and beating a drum, with a bearded man’s face emerging from red flames. This fearsome creature is a bit of an extension of the tympanum, a true masterpiece that contains the only statues in the entire cathedral that survived the iconoclasm of the Reformation. 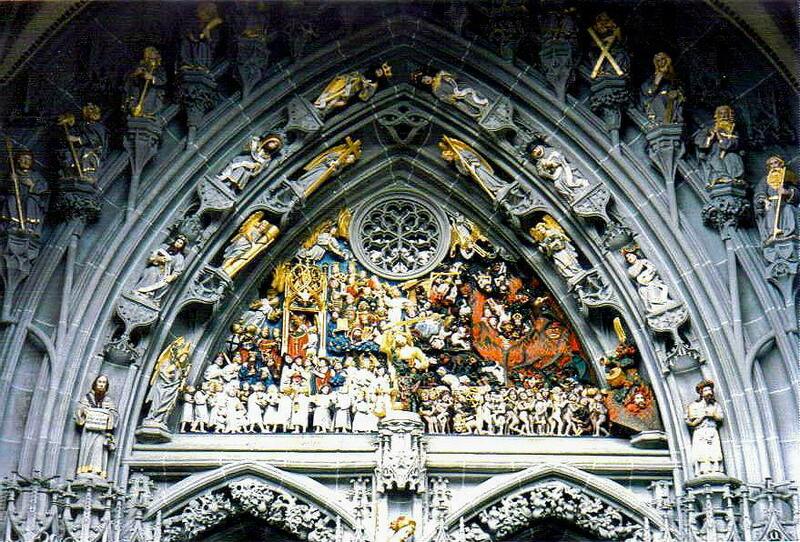 More than 15 feet wide at the base, the tympanum depicts the Last Judgment with more than 100 sculpted figures that are nearing 600 years old. In the center, Justice stands with her scales at her feet, tipped in favor of the righteous by an innocent sitting in the left pan, palms pressed together in prayer. The left side is crowded with the saved, clad in white against a sky-blue background, mixing with saints, bishops, and a solider or two, some holding gold crosses. The figures on the right do not fare as well. The Hell side of the tympanum teems with the wicked — a dystopian realm of naked figures suffering at the hands of demons and barbaric beasts with ferocious teeth in the midst of red flames against a black background. Those 10 virgins also make an appearance in the portal of one of the top five churches in Ireland — Saint Fin Barre’s Cathedral. 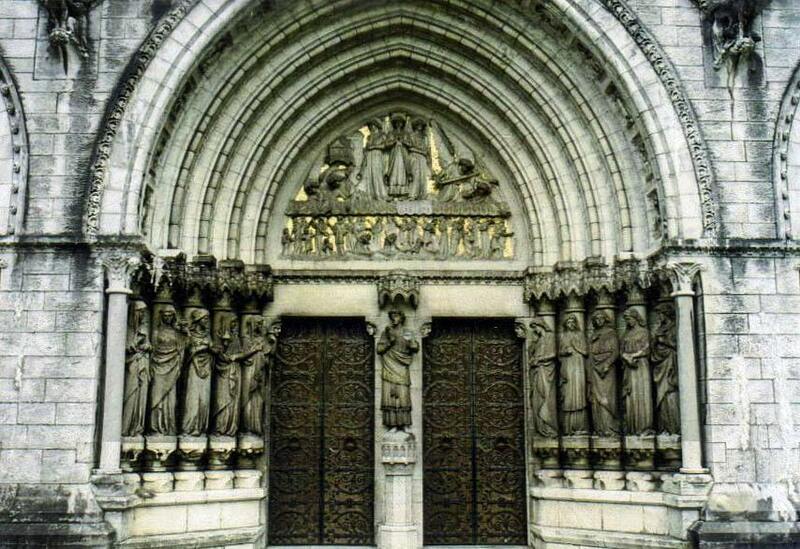 This gorgeous limestone cathedral in Cork dates to 1879 and boasts more than 1,200 sculptures, including the very fine ones at the three deeply recessed portals at the entryway. The 12 apostles and four evangelists flank the doors of the North and South portals, both of which are topped with an impressive tympanum — the expulsion from paradise on the north, Abraham sacrificing Isaac on the south. The central portal, however, is the one that really grabbed my attention. On the side of the left wood door with intricate ironwork, the five Wise Virgins hold their flaming oil lamps; at the matching right door, the dejected Foolish Virgins ruefully clasp their empty vessels. Between them, in the trumeau, the bridegroom faces the Wise Virgins while raising an off-putting hand to the Foolish Virgins — sort of a Biblical “talk to the hand” dismissal. Faithful churchgoers understand the message of this parable (simply, be prepared), knowing that their entire life comes down to the Day of Resurrection, depicted in the tympanum above the doors. In this scene, the dead rise from their graves to the sound of three angels blowing horns. Two additional angels extend their hands to some of the dead, welcoming them into heaven, but two others point the way out for those who didn’t make the cut. When it was completed in 1930 at a cost of $2.3 million (a whopping $1.1 million over budget), the 22-story Marine Building wasn’t merely the tallest building in Vancouver — it was the tallest building in the entire British Empire. Art Deco enthusiasts routinely praise it as one of the world’s finest examples of the style. With a reputation like that, I knew I would see something spectacular at this downtown structure. All of my expectations were surpassed when I entered the opulent lobby, which resembles a Mayan temple and also happens to house one of the world’s top five clocks. But before I stepped inside, I stopped to admire the soaring entryway of this magnificent terra-cotta building, heavily ornamented with every kind of marine life imaginable. Designed by the architects to evoke “some great crag rising from the sea, clinging with sea flora and fauna, tinted in sea-green, touched with gold” in anticipation of the city becoming a major Pacific port, the Marine Building shames its newer and duller glass and steel neighbors on every level. 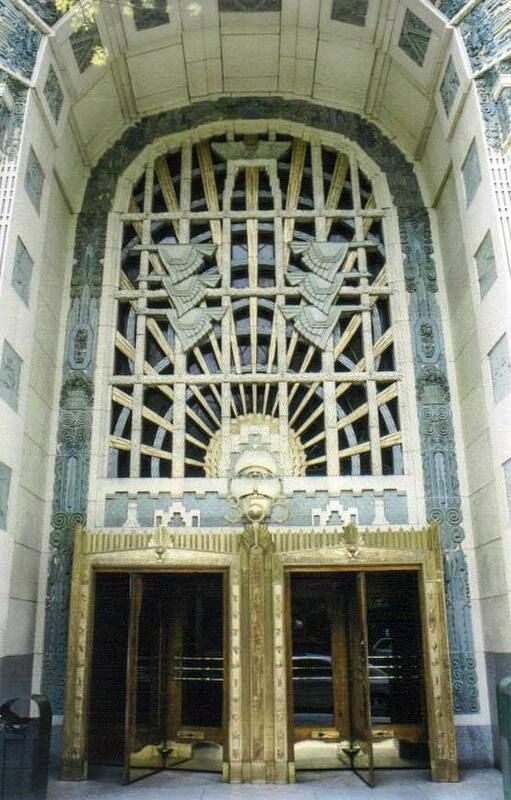 The two-story deeply recessed entry features an arch inlaid with relief panels of then–state-of-the-art forms of transportation (zeppelins, biplanes, and steamships). Vertical bands of aquatic plants and seashells soar up the sides, continuing into the curve above. Seahorses, turtles, cephalopods, starfish, and crabs ride waves up and down the sides of the brass frames around the revolving doors, both of which are topped by an osprey clutching a fish in its talons. Above the doors and directly behind the building’s address number, a three-dimensional sailing ship emerges from the half orb of a rising sun, its 15 rays shooting out to the edges of the arch. A flock of half a dozen Canada geese fly off in two directions, and another osprey at the very top of the arrangement observes it all. Before I explored the excellent collection in London’s Natural History Museum, from its dinosaurs to the interactive Kobe earthquake exhibit, I stopped to marvel at the entry. Completed in 1880 after seven years of construction, the sprawling 700-foot-long building is clad in attractive fawn and blue-gray terra-cotta. I approached the two side-by-side doors of the main entrance via a wide and gently rising staircase. 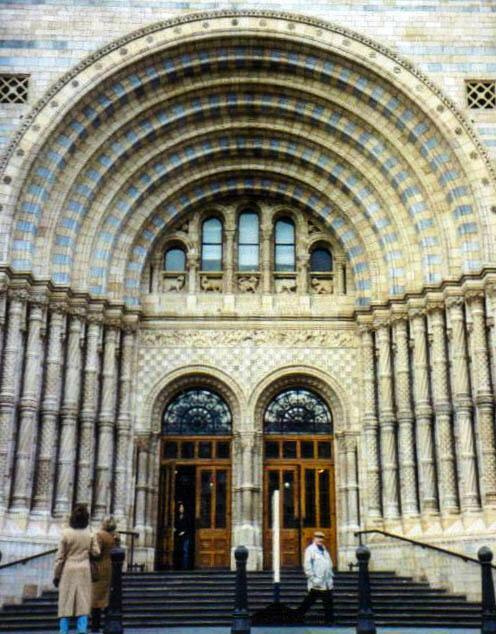 The fanlights above the doors are topped by rounded arches amid a checkerboard pattern. The frieze above that features a parade of animals working their way through a tangle of vines and leaves. On either side of the doors, 16 columns with strong capitals and alternating patterned shafts support the eight arches of the tremendous recessed arch above, and each one of those switches between strictly fawn terra-cotta and the combination of alternating bands of fawn and blue-gray. Between the doors and the lowest arch, half a dozen shorter columns support five finger-like arched windows. Animals in high relief, including a kangaroo and a snake taking on a wolf, rest below each window, and two animal heads peek out at the corners. 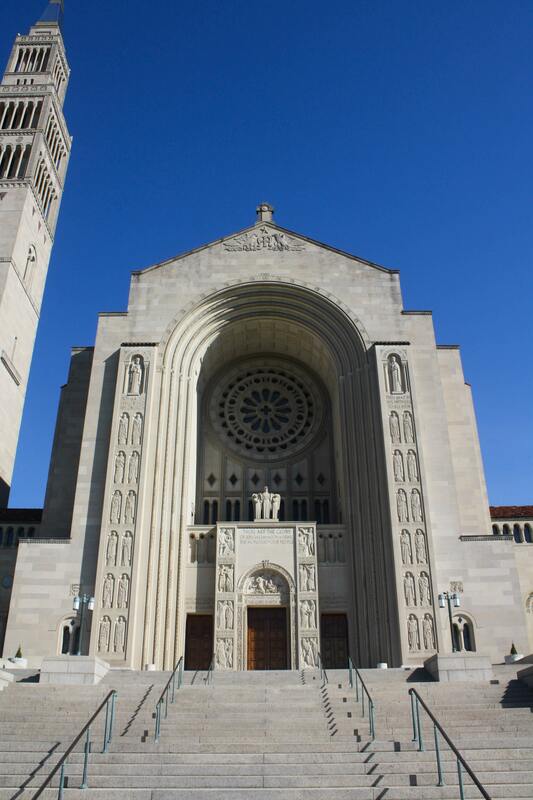 One of the top five churches in Washington, D.C. — and the largest Roman Catholic church in North America — boasts one of the world’s best entryways. Approaching this massive structure on the campus of Catholic University of America, I was first attracted to the wonderful Byzantine dome of blue and yellow mosaic tiles, then the towering campanile. But as I started to climb about two dozen steps of the wide staircase at the processional entry, my eyes were front and center. An enormous recessed arch protects a rose window with a cross for its bull’s eye within its depth. On either side, six pairs of important Biblical figures, from Matthew and Moses to John and Jonas, stand in shallow niches, one on top of the other. The triquetra holds a place of honor in the keystone position at the top of the arch. Each of the trio of front doors has lettering etched into the façade above them, referring to Mary as the “holy queen mother” and “queen of heaven.” The central door protrudes from the building, with the opening of the Ave Maria prayer beneath it, “Hail Mary, full of grace, the Lord is with thee.” Above it in the sculpted tympanum, the angel Gabriel announces to Mary that she would conceive and become the mother of Jesus. No matter which door you enter through, you know exactly who is being honored here, and that everything on the other side of the door will be astounding.